During October I will post weekly Monday morning comments concerning the Daily Short Range T chart as usual. Please download and save the the important new Bull and Bear market history below. This spreadsheet summarizes the important stages of the 1929 to recent peak swings in the S&P 500. It is an excellent starting point for students of the market. Later I will tie its history into the 40 Year cycle. 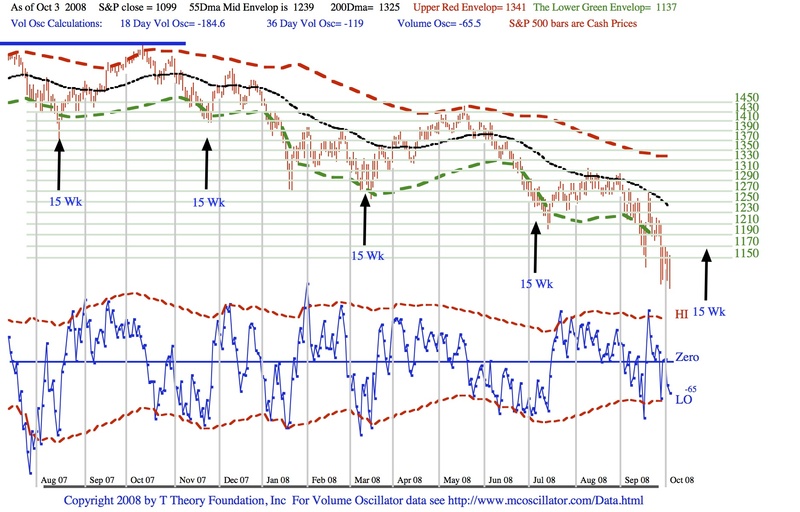 This weeks chart shows all the T Theory concepts need to to track the Forty Year cycle as it puts downside pressure on all investment classes going into 2010. Note the oscillator peaked just above the zero line last week as expected and the market averages should be declining to the projected 23 week cycle low in late November. 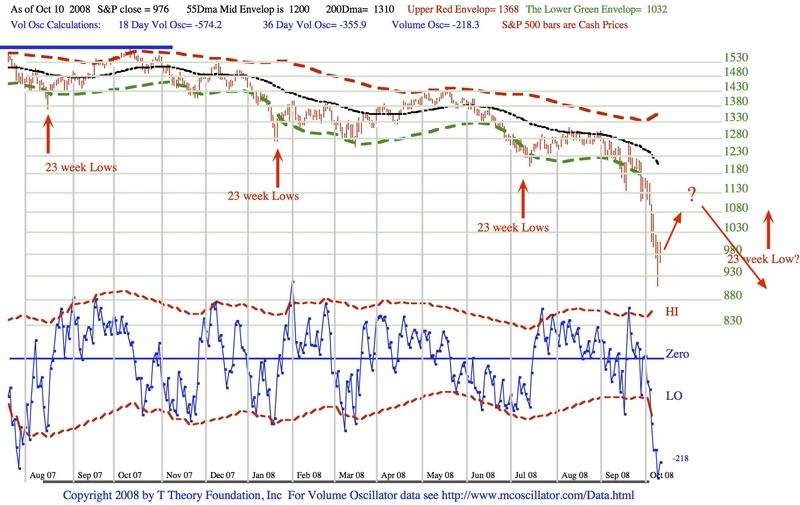 The actual low is better determined from the oscillator pattern in late November. A rising Oscillator bottoms pattern with the S&P still making lower lows is the usual sign of an impending up turn. Last week I discussed the 23 week cycle and the likelihood it would extend the current steep decline into early December. 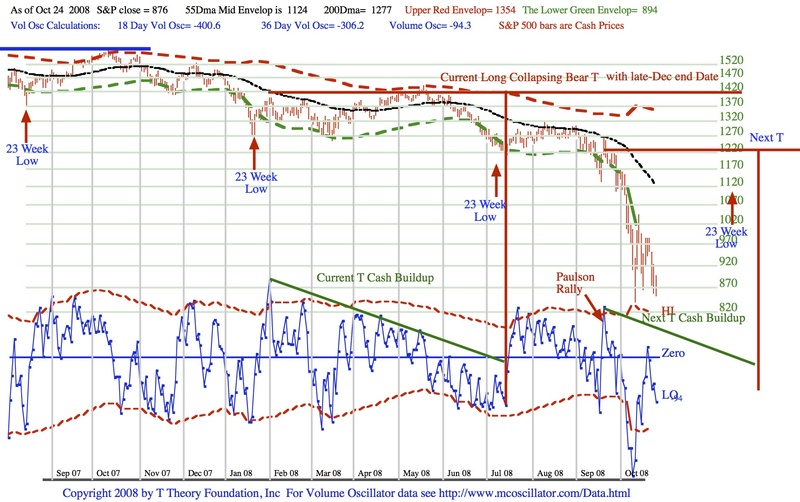 This week that same forecast can be seen from the current chart which diagrams the long time span of a collapsing Bear type of T. Bear Ts are common in down trends and permit an ongoing decline to continue into the right side of a T.
In this bear market the green cash build up period lasted almost 5.5 months making this a very long T which puts the projected right end date in mid December near the 23 week cycle low as noted in last weeks chart. Once a Bear T collapses in its right side, the best recovery rally usually only occurs in the one to three weeks just prior to the T’s projected peak date at the right end. This implies that the oversold rally into the mid December projected peak date will be the more important one and the current rally will fail as soon as the market becomes very short term overbought. The overbought condition for the very short term may take the form of a blue volume oscillator reading that has gone positive, that is above the Blue Zero level or it may not become overbought until the S&P has regained about 50% of the decline from the August peak. The oscillator will turn positive this week and I estimate the 50% retracement is about 1070 on the S&P 500. Beyond this criterial we will have to wait out this weeks activity. In this weeks chart we are seeing the 40 year cycle’s wrath as it sets an ongoing course for the greatest destruction of equity since the Great Depression. My basic long term forecast is targeting a low at Dow 4300 sometime during 2010. This projection comes from an analysis of the 1930’s data in the table introduced at the beginning of October. I will cover this conclusion in a later report. Shorter term I have emphasized the 23 week cycle’s projection of lows at roughly 5 month intervals in the S&P upper plot by the red arrows. As I have discussed in prior reports it appears that this bear market is being dominated by a combination of a 15 week cycle and a 23 week cycle as viewed by the blue volume oscillator’s oversold pattern. The 15 week cycle is now likely bottoming and a normal recovery would retrace about 50% of the steep slide. It would be bearish however if this normal recovery cannot be fulfilled as the larger and stronger 23 week cycle is still turning down into a later, lower low, and the 40 year cycle’s down phase is very dominant right now. One final point on these two cycles. The 23 week cycle low estimate derived from the volume oscillator looks to late November, but if those lows are transfered to the S&P pattern above as I have done with the red arrows pointing to the actual S&P lows, then mid December is probably the better estimate for an eventual low and beginning of a year end rally. We need to see how the recovery proceeds next week before going on with my recently expanded T Theory analysis derived from the daily history of the 1929-32 40 Year Cycle decline and it companion 40 Year Cycle, the 1973-74 decline. The key will be to see how the market performs after the sharp up day on Monday and a probable carryover into Tuesday. 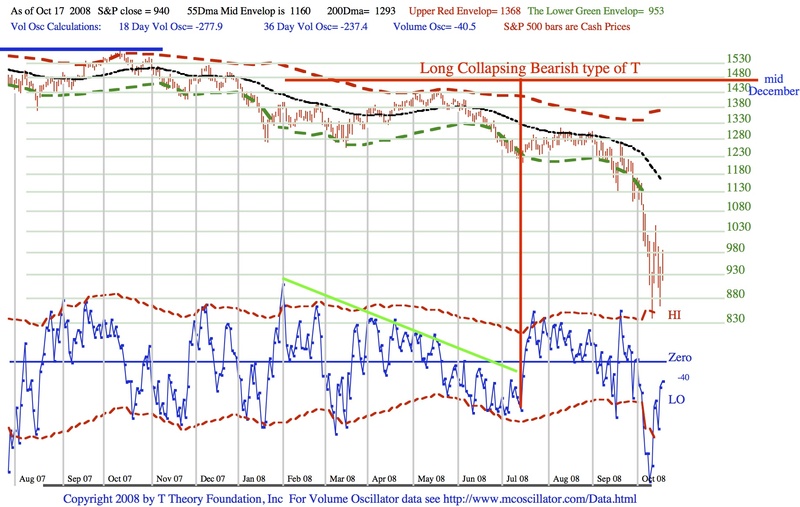 The question beyond this reflex trading rally is whether longer term investors will still be interested in buying and thereafter how their day to day actions compare with similar oversold rallies during the 1929-32 and 1973-74 period. Note the Arrows identifying the approximate 15 week lows discussed in an earlier post. We should start to see a bottoming process in the next week or two if the progression holds. But the situation is more complex, as explained in my earlier posting, by the concurrent 23 week cycle which is pressing for a lower low in late November. All cycles considered, I believe a that as we pass mid October, some sort of 3-5 day rally will occur, but it will just produce a short sharp bounce back up towards the 55 day MA. Then very quickly the market should move down to new lows into late November. This entry was posted on April 17, 2013 at 11:56 AM and is filed under . . . T Theory®. You can subscribe via RSS 2.0 feed to this post's comments. You can comment below, or link to this permanent URL from your own site.